GogTasks - My tasks have been deleted! Can I get them back? My tasks have been deleted! Can I get them back? When unwanted deletion happens, you do still have a fair chance of getting them back. Both Outlook and Google stores a copy of all deleted tasks in their trash cans. GogTasks does not override this. 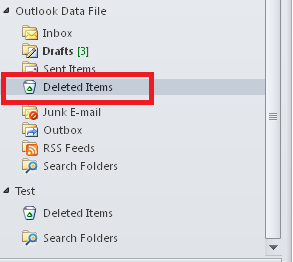 Outlook has a folder named "Deleted items" (screenshot from Outlook 2010). Make sure you have selected the Outlook Data File or whatever your local store is named, and not an email account like hotmail or gmail. Select the tasks you want to undelete, right click and select "Move > " to the folder you want to move them to. As for Google, I prefer to use the Google Tasks Canvas when working actively with the tasks. This interface has a button named "Trash" to the far right. Note that each list has its own trash can, so you also need to select the list where you suspect your deleted tasks are. Finally, click the left-pointing arrow to undelete each tasks (you will have to make one click per task).